Doesn't look so scrappy, huh? I'll post more pics post-washing but thought I'd get this up now so my finished quilt post isn't marred by my complaining about the lack of scrappiness! I made a scrappy binding but made way more than I needed so I cut it down and it turns out now most of it is this polka dot print. 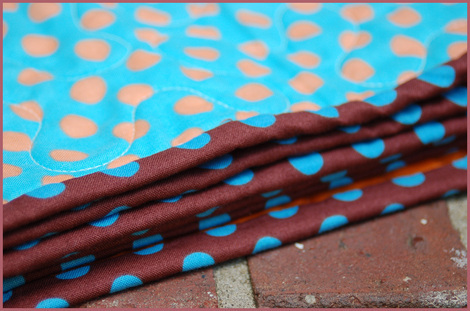 I love me some polka dots but now the binding looks like mostly polka dots with a few random bit thrown in. Oh well. I've learned now to actually measure binding and not just make way more than needed! This page contains a single entry from the blog posted on May 15, 2011 4:32 PM. The previous post in this blog was Wonky top finished!. The next post in this blog is Finally Finished! .